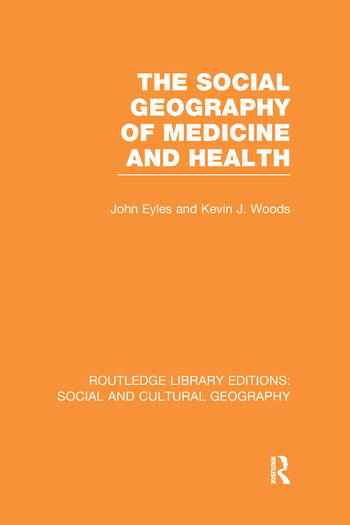 This book, originally published in 1983, drawing material from Europe, the USA, the Soviet Union and the Developing World, provides a comprehensive review of the key issues in medical geography. It sets the central problems of medical geography in a broad social context as well as in a spatial one and analyses changing conceptions of health and illness in detail. It also explores the pathological relationship between people and their environment and illustrates that social phenomena form spatial patterns which provide a good starting point for the examination of the relationship between medicine, health and society. 1. Perspectives on Health and Health Care 2. Changing Conceptions of Health and Health Care in Urban Society 3. Man, Disease and Environmental Associations: From Medical Geography to Health Inequalities 4. Perspectives on the Location and Distribution of Health Services 5. Practical Responses: The Effects of Constraints 6. Societal constraints and Systems of Health Care Provision 7. Directions for Social Geographical Research. Bibliography. Indices.